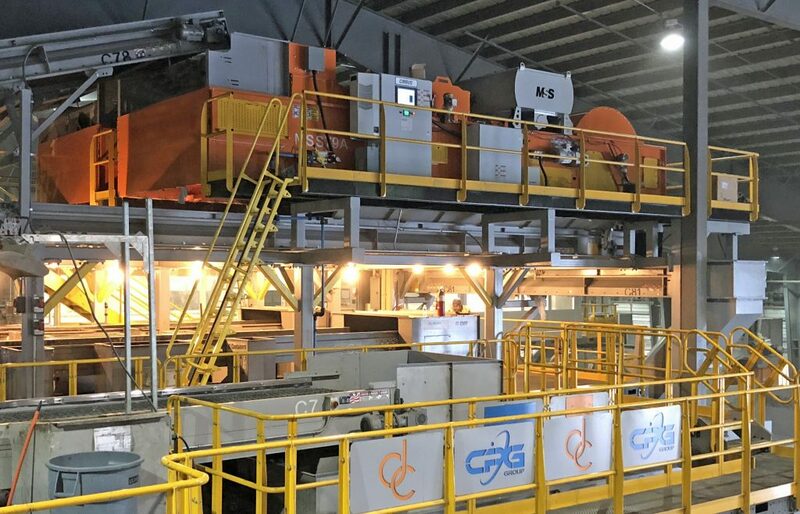 Between summer 2017 and 2018, Dem-Con Materials Recovery, Shakopee, MN, retrofitted their single stream MRF with three new MSS CIRRUS® optical sorters from CP Group. Another MSS CIRRUS® sensor is currently in production and will install this summer. The three MSS CIRRUS® optical sorters installed pertain to fiber. The units increase recovery, improve product quality and reduce sorter headcount on the fiber QC. “The result of the retrofit has been that we are able to diversify and solidify our end markets while decreasing our operations costs. We are able to establish a high quality reputation in the market for selling paper. We have also realized the ability to recover cleaner containers from the paper screen and maximize the container value,” stated Mark Pahl, Dem-Con co-owner. The 2017 retrofit included a MSS CIRRUS® optical sorter on the tail of the CPScreen™ before the container line. The 2018 retrofit included two MSS CIRRUS® FiberMax™ optical sorters on the fiber QC lines. The CIRRUS® at the beginning on the container line positively sorts any remaining 3D fiber and sends it back to the fiber lines while simultaneously cleaning the containers. The two FiberMax™ units on the fiber quality control lines negatively sort fiber (positively ejects non-fiber) in place of human sorters. MSS CIRRUS® FiberMax™ optical sorters run at 1,000 feet per minute, which is higher than the industry standard for belt speed. This lightens material on the belt and increases accuracy by decreasing collateral damage. The higher belt speeds also increase picks per minute. MSS uses their patented PrecisionFlow™ eject hood in combination with air-assist systems for precise material handling of flexible material. Dem-Con is currently in the process of retrofitting their MSS Aladdin optical sensor on the container line to the newest MSS technology, an MSS CIRRUS® PlasticMax™. This optical sorting unit will positively sort PET. MSS CIRRUS® units combine high-resolution near-infrared color and metal sorting which allow a wide variety of materials to be sorted on a single machine including color and metal. “We continue to work with CP because they are responsive, listen to our needs, and always deliver on time. CP’s team, through many variations of design showed patience and a commitment to find the best retrofit design. We had a lot of teamwork between our companies throughout the design process. CP always has innovative and facility specific ideas and we really value the relationship,” continues Pahl. The 20 TPH MRF was originally installed by CP in 2013 and serves the Twin Cities and greater Minnesota. “Dem-Con is a very progressive company. They adapt and create opportunities as material streams and markets evolve. We always enjoy working with this group and are proud to call them a long-time customer,” said Ashley Davis, Director of Sales and Marketing of CP Group.